Dry your expensive knit sweaters with this rustproof, stain proof sweater dryer that has a sturdy plastic frame with a porous net surface. Assembles quickly (no tools required). Buy two sweater drying racks and stack them for double the drying space. 27"Lx27"Wx5 1/2"H.
My previous sweater rack broke so I was delighted to find this item in your catalog! I bought two so we can dry two sweaters at once. I like the stackable design. Everyone needs at least 2 of these! I use it to dry not only sweaters but any clothing that would lose its shape being hung to dry. I love that its stackable. The hanging hook distorts the netting if left on, but I afraid to much taking it off and on will increase probability of breakage. Sweater Dryer; Easy to put together! The Sweater Dryer was easy to put together. I bought 2 and can stack them. A vast improvement over drying on a towel on the floor. Thanks for such a simple solution. I have been looking for this items for years as I have 3 sweaters that have to be hand washed and laid flat to dry and I wasn't able to. Now that I have them I can now wear my beautiful sweaters with no worry. A pair of these replaced an ancient pair of net sweater driers which had served effectively but had torn at the corners and no longer stayed on the frame very well. These new ones have reinforced loops and smooth posts - a much better design that won't tear. They stack effectively and, when no longer needed, collapse easily and hang to store. I will probably buy another pair next fall before winter sweater washing season. If you value your better sweaters, this dryer is ideal to help keep their shape! Great use of space since it's is stackable and can be folded when not in use. This product is very lightweight and easy to use. This dryer is not heavy duty but does a great job of drying sweaters in a short time. I like it a lot and would recommend it. Love it for my 'dry flat' sweaters. I use it on my sewing room table. Perfect for the several sweaters my husband and I have that need to be laid flat to dry. Air circulates around them so both sides are drying at the same time. Years ago I had to just stretch them out on towels on the guest bed, then switch towels and turn them over for the back to finish drying-----took way too long! This sweater dryer was easy to assemble, and a good size for drying a large, bulky sweater. It was a little too large to fit nicely on the top of my washer or dryer, but once I put it on a table it worked fine. After use it folds back up easily to store out of the way for the next time I need it. I really like being able to dry sweaters flat. 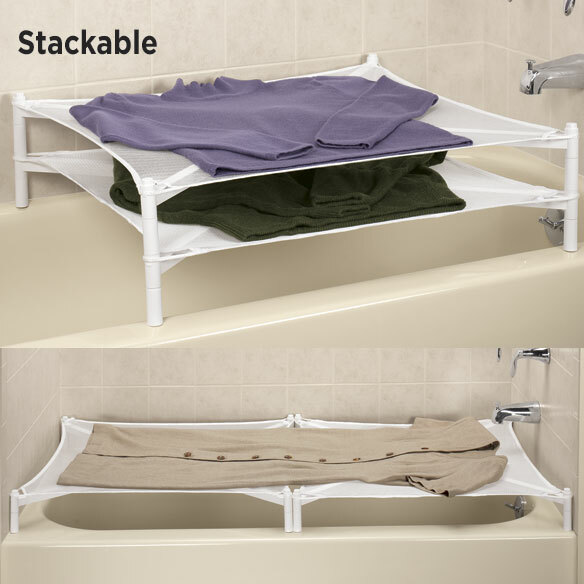 I wish racks would fit over my bathtub easier, and I wish they stacked easier. Too much trouble to get them together, so I just spread the racks. Sweaters turn out really well. Nice space saving item since they stack so nicely. A great item, I bought two! I double stacked the sweater dryer and found that the bottom sweater took at least three days to dry. I ended up putting it in the basement because it was in the way in the bathroom. Other than that I love the product. The stacking is too close together. It works well but would prefer greater distance between each dryer. It's not long enough for flat drying pants but you could use two dryers end to end for this. I have been looking all over for a sweater dryer to replace my old, old one. Finally found it here. Does not fit in my bathtub. Hard to assemble as parts keep falling apart. Should be a great way to dry sweaters. I expected this to be a flat dryer. In fact, it folds shut for storage, but is difficult to close and I am returning it. Item not as pictured. As compared to the one ordered a few years ago, the one currently shipping has an "X" support base underneath the mesh, which may prevent full air circulation for faster drying. However, it folds for storage, and still can be stacked with the old model. It helps keep sweaters in good shape, has good ventilation for drying, etc. Used weekly during the winter months. The picture is not what I got. They are sweater dryers, but I don't like the ones I got. They are not the ones in the picture. I won't buy them from here again. Very diappointed in this product. The cover sags when I lay a wet sweater on it to dry. The picture was misleading. I expected the same type of sweater dryer that I purchased several years ago and love. The dryers I received fold for easy storage but are made with flimsy materials. The legs are two pieces, not one, and separate easily. The netting is very easily dislodged. Each dryer must be positioned exactly or it separates from the others when stacked. These dryers are very disappointing. They cannot compete with the dryers that I purchased before. I have one of these I bought several years ago. This one, I thought, was the same kind. It looked the same on-line. It is much more flimsy, and leaves an impression where the sweater sits on the X. I am returning it. Not the quality that I expected. I ordered additional dryers to go with ones I had purchased in the past. The dryers I received were not as pictured - could not be used with my originals and were flimsy. The frame was an "X" not a square. on the side that goes over the pipe. the other three slide on the pipe as you put it together. better design then the one currently being sold. I wish you'd look into offering the older version. These are very cheaply made. The frame is shoddy as is the netting. I was able to purchase a much better product for less locally. I have purchased these before from MK with no problem. This new design has a net that really doesn't fit, so the sweater sagged right down and dried lumpy, not flat. I will have to discard this product and look for something better. Currently I'm doing some of my daughter's washing and she has a lot of things that has to lay flat to dry.